Tonight we have come together to celebrate the joyous holiday of Simchat Torah and also to dedicate a 147 year old Sifre Torah, survivor of the Nazi holocaust. From the small town of Kojeten in Czechoslovakia, this Sifre Torah has come to Temple Menorah - Keneseth Chal. It has traveled in time, measured by its 147 years of existence. If it could talk, it would tell us of its many trials and tribulations, wars, persecution and the murders of so many Jews who had kept if and other Sifre Torahs so dearly to their hearts and minds. Thousands of measured miles, it has traveled, carried by many Jews, yet also touched by those of its enemies who sought to destroy its teaching and to ani~ate the people who worshipped its very existence. Along with the 1563 other Torahs it lald piled in a building in the city of Prague in Czechoslovakia where the Nazis were creating a Museum of Artifacts from a race they thought they could destroy. The Torahs remalned there long after World War II ended until February 1964 when after successful negotiation with Czech government all the Sifre Torahs were transported on February 7, of the year to Westminster Synagogue in London, England. Westminster Synagogue had become the Trustee of the Sifre Torahs. Their task was a delicate one, to reconstruct each Torah, to obtain the services of a skillful scribe from Israel, who could restore many of the Hebrew words, no longer there because the parchments were desecrated by fire and scarred by misuse and with the help of others to restore the beautiful posts which held the parchment and then to place all the Torahs in Synagogues throughout the world. Our Sifre Torah's journey to America began with a letter to Westminster Synagogue CI'rustee of the Czech Scrolls) written on March 4, 1984 which I was able to hand deliver to London and in May 1984, our Torah started a new journey to the United States of America to a new land of freedom to awalting Jews of Keneseth - Chal, who would love this Torah as one loves a newborn baby, or life itself. And tonight, it is here, in our holy Ark to be looked at, touched and loved by yet another new and yet old family - Temple Menorah - Keneseth Chal. If we closed our eyes we could almost imagine the joy of the small Jewish community of Kojeten, in Morovia Czechoslovakia, where our Sifre Torah was first dedicated. The little Shul on the street named Juoden Strassur "Street of the Jews." In my search to learn about the Jews of Kojeten, I found they had settled there in about the 12th Century, the period of the crusaders, in search of refuge from the persecution and looking for what peace they could find in other countries, Juoden Strassur "Street of the Jew". How much peace could they have found. Tonight, I must speak of my experiences with this sacred Sifre Torah. Yes, sacred because it is our heritage given by God and surely Torah is our existence. When you touch it, or hold it to your bosom as I have you will feel a wonderful sense of belonging and warmth inside you and you are proud of being a Jew. Being Orthodox, conservative, reform or reconstructionist are of secondary importance. Being a Jew and holding thousands of years of our people's beginning far out weighs all else. As I mentioned before in March of 1984 I traveled to london, England on business ,and I also carried with me a letter from the president of Keneseth Chal, Dave Lieberman, authorizing me to represent the congregation in obtaining one of the 1,564 scrolls. Needless to say I was very excited. I contacted Ruth Shaffer, the honorary secretary of the Memorial Scrolls Trust at Westminster Synagogue in Ruthland Garden's London and arranged to meet with her and Rabbi Freidlander. When I arrived at the Synagogue, I presented my letter and we discussed obtaining on permanent loan, one of the Sefre Torahs. than mere parchment, survivors of the holocaust, I became overwhelmed with emotion and I felt the tears form my eyes, descending down my face. I remembered when Ina and I were in Israel and we visited YADVASHEM. Carved in stone were hundreds of our people being lead to the death camps, one part of that always remains with me, the old Jewish man, A "Za Dah" carrying a Torah in one hand and holding the hand of a young child in the other and my thoughts turned to my visit to Dacha in 1955, and what I saw there, and the horrors I pictured in mind never to be forgotten. I wanted to scream to the whole world, that never, never again shall we Jews let this happen. Never can we let our guard down, so many thoughts as I silently cried. Later when I recounted my emotional experience to Mrs. Shaffer, she told me of a story of a christian Czech who was awe-stricken and shaken as he gazed upon what seemed to him "hundreds of corpses in transparent shrouds," as he counted over the many Synagogues from which the scrolls had come and which he had known, and as he brought to mind his "small Jewish school-mates, later friends, who must have looked with religious fervor on the scrolls." And yet this same visitor, becoming more calm, saw "a mountain of dead books, spiritual bodies so to speak, and yet a mountain glowing with the life of revelations, law, promise. Mrs. Shaffer spoke of a Jew from Jerusalem, standing before the scrolls, seemed to hear "the walling of the Jews being led to the slaughter. The cry of the hundreds of communities, ravaged, and slain, echoed in his ears". Such sentiments have been expressed again and again by scores of visitors, English and Foreign, Jew and non-Jew. Perhaps she said, the most eloquent of the counfless comments was the simple word of a christian woman, spoken when reference was made to her own personal pains during the war, which were such as to break most stout hearts she stated: "My pain is a matter infinitely small when I think of those sacred scrolls." When I received word that Keneseth - Chal would be given one of the Memorial Torahs, I arranged to bring the Torah back with me when returning from a business trip to London, joined by my wife Ina and daughter Illene. We left London on a Pan Am 747 flight to New York City. I had made arrangements to bring the scroll on board with me. When entering the aircraft, I was met by the Chief Purser, who asked if he could assist me in storing my large package. When I told him the contents, the expression on his face was solemn but yet filled with sincerity. He informed me that the Torah would be stored in a secured area near the cockpit and I could inspect it at any time. What a coincidence this Pan Am flight had originated in Frankfurt, Germany. The Purser and other crew members were Germans. When I think about it, I sometimes wonder if it was a coincidence. 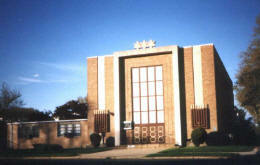 The Sifre Torah was first dedicated at Keneseth Chal in 1984. I could not be present for such a joyous occasion, due to a business trip to Australia. When I returned, I was informed about yet another coincidence. On the Shabbat on which the Torah was dedicated our then student Rabbi, thought it would be appropriate to read a passed from the Torah. When the scroll was opened, the Rabbi was aghast as he looked down on the 147 year old parchment and saw the exact passage for that Shabbat. I must tell you that several months before the dedication, the parchment had been unrolled by me to remove one post which was damaged. When it was repaired, I sewed the parchment back on to the post and rolled the Torah so that the parchment would be equally distributed on each post. Again is it a coincidence. An so my friends, this sacred Sifre Torah brings to me and I hope to you a special message. A message strong and vibrant, that the ideals of Judaism have survived the tests of time and the spirit of Torah and its teaching lives on. Toward the end of the War II, in a field in Germany, a Jewish Chaplain holding servic, said to the soldiers there, "The sof Torah is endless with ." It lives in the air, the earth and the water. As long as the gem of Torah exists (as we witness through our 147 year old Sifre Torah) there will always be Jews willing to live and abide by its principles and teachings. Beautiful words, and this is my story, I am proud to have been a small part in helping to bring our Sifre Torah to its new home at Temple Menorah - Keneseth Chai.